Grenoble moved to the top of European Challenge Cup Pool Five with victory at London Irish, who are now unlikely to qualify for the knock-out stages. Shane Geraghty kicked Irish into an early lead with a penalty. But tries from Armand Batlle and Nigel Hunt helped Grenoble build a 21-6 lead by the break. Charl McLeod's second-half score and 13 points from Jonathan Wisniewski's boot sealed victory before Dom Waldouck and Alex Lewington scored consolations. 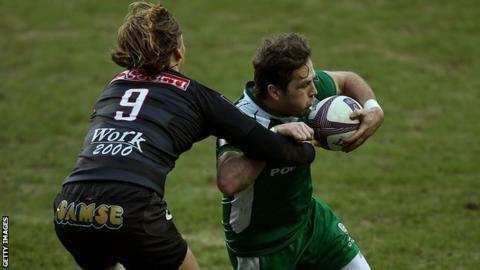 Defeat leaves London Irish, who made 11 changes from their Premiership victory against Newcastle, five points behind second-placed Edinburgh in the group ahead of next weekend's final game at Agen. Grenoble finish their pool games at home against Edinburgh knowing victory will guarantee a place in the quarter-finals. London Irish: Ojo; Lewington, Mulchrone, Brophy-Clews, Fowlie; Geraghty, Steele; Smallbone, Cruse, Aulika, Curry, Sinclair, Guest, Trayfoot, Narraway (capt). Replacements: Stevens, Court, Halavatau, Gilsenan, Sisi, Allinson, Williams, Waldouck. Grenoble: Aplon; Dupont, Farrell, Hunt, Batlle; Wisniewski, McLeod; Taumalolo, Heguy, Edwards, Hand (capt), Kimlin, Vanderglas, Diaby, Grice. Replacements: Jammes, Coulson, Desmaison, Marie, Setephano, Saseras, Gelin, Kilioni.